Ion channels are pore-forming proteins that allow the flow of ions across membranes, either plasma membranes, or the membranes of intracellular organelles . Many ion channels (such as most Na, K, Ca and some Cl channels) are gated by voltage but others (such as certain K and Cl channels, TRP channels, ryanodine receptors and IP3 receptors) are relatively voltage-insensitive and are gated by second messengers and other intracellular and/or extracellular mediators. As such, there is some blurring of the boundaries between "ion channels" and "ligand-gated channels" which are compiled separately in the Guide. Resolution of ion channel structures, beginning with K channels  then Cl channels  and most recently Na channels  has greatly improved understanding of the structural basis behind ion channel function. 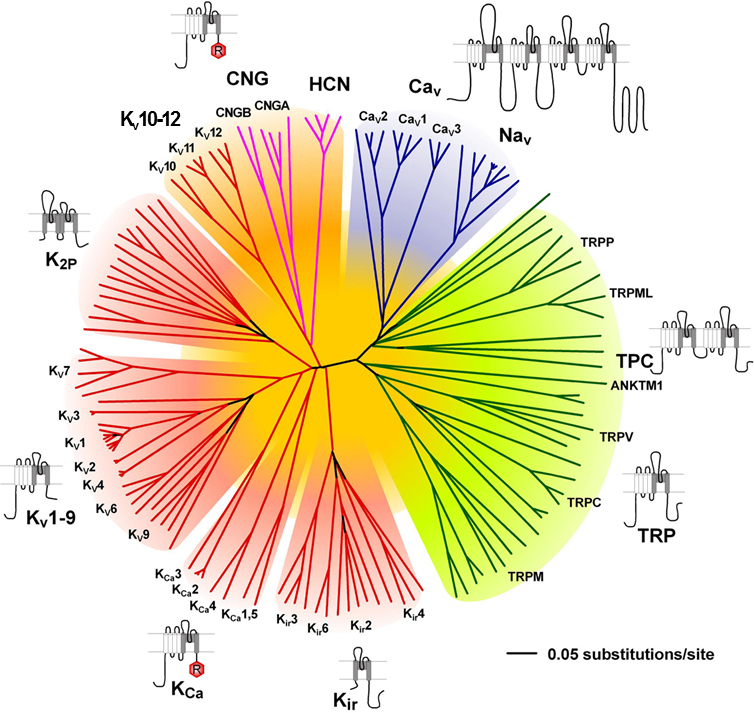 Many ion channels (e.g., K, Na, Ca, HCN and TRP channels) share several structural similarities. These channels are thought to have evolved from a common ancestor and have been classfied together as the "voltage-gated-like (VGL) ion channel chanome" (see ). Other ion channels, however, such as Cl channels, aquaporins and connexins, have completely different structural properties to the VGL channels, having evolved quite separately. Currently, ion channels (including ligand-gated ion channels) represent the second largest target for existing drugs after G protein-coupled receptors . However, the advent of novel, faster screening techniques for compounds acting on ion channels  suggests that these proteins represent promising targets for the development of additional, novel therapeutic agents for the near future. Ion channels. Accessed on 19/04/2019. IUPHAR/BPS Guide to PHARMACOLOGY, http://www.guidetopharmacology.org/GRAC/FamilyDisplayForward?familyId=689.